There are currently two quiet zones on the K&A, at Honey Street and Avoncliff. Reports from Alton Parish Council are that the one at Honey Street is working well. 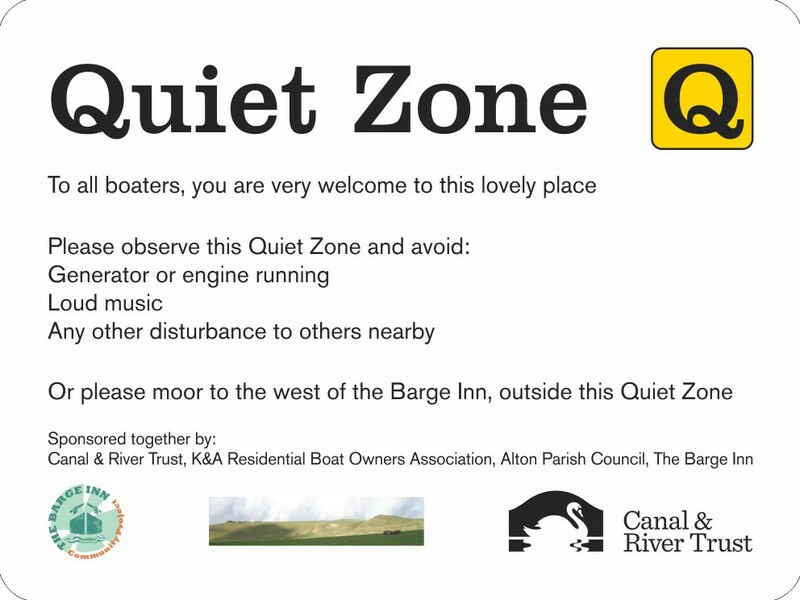 The quiet zone at Avoncliff was put in place following complaints from local residents about noise and disturbance from hire boats, especially stag parties. Quiet zones are advisory rather than compulsory, but in some circumstances local authorities can take action against noise nuisance. Matthew Symonds of CRT told the meeting that a Considerate Boating leaflet had been distributed on the western K&A, especially to hire boat companies’ customers, and will also be distributed on the eastern side of the canal. It includes information about who to contact about incidents involving hire boat crews. This entry was posted on Thursday, October 9th, 2014 at 2:21 pm	and is filed under Mooring. You can follow any responses to this entry through the RSS 2.0 feed. You can skip to the end and leave a response. Pinging is currently not allowed.